Welcome to the Arduino programming lesson part 1. 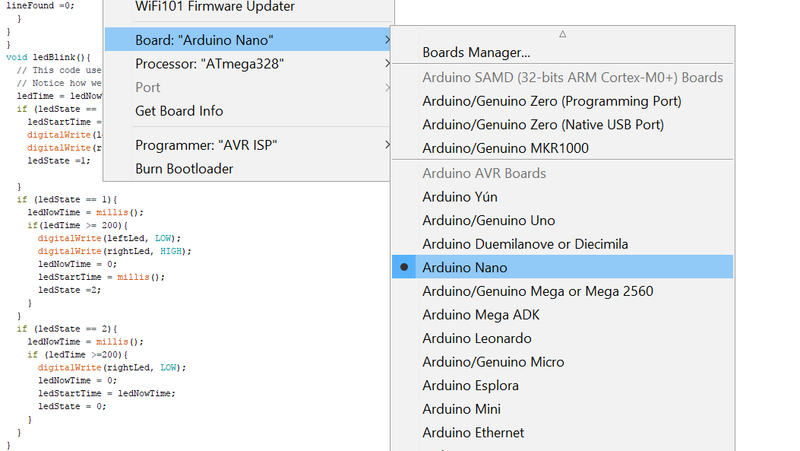 Arduino is an open source electronics programming software and harware. You can use Arduino to read sensor input like a switch, echo of sound, light relections and millions of other inputs and create commands to control motors, lights and other actuators. Arduino is simply the most popular robotic learning platform for students, hobbyists and professionals. This being an open source platform, a vast amount of information is easily available to develop thousands of projects. Froboduino is an initiative by Hobbyandyou.com team to take this movement forward to teach children this the fundamentals of electricity an electronics. We will guide you through thse easy to undersatnd lessons in several parts. We are sure that after the completion of Frobo module V4, you will be in position to develop your own applications of increasing complexities. We have created our own development board called froboduino with a motor driver and a two channel Op-Amp LM358 to enable children to develop not only Frobo module but also a lot of other useful projects. Froboduino can be programmed with Arduino uno or any FTDI programmer. Separate programming ports are provided for easy to use programming. You will need a laptop or a desktop to get started learning this. You can do with any laptop with windows, MAC or LNUX based operating systems. Arduino has a lot of older versions available for different generations of systems. 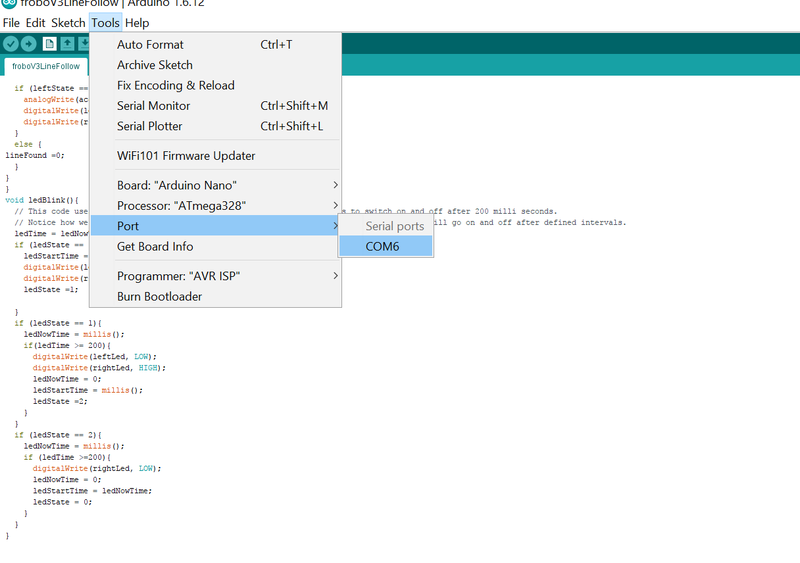 You need to download right version of Arduino IDE (Integrated development environment) from the link below. After downloading the IDE, install the IDE by following instructions. You can find detailed instructions here. Your Frobo V3 kit includes a separate Arduino Uno as a programmer and also as your indenpendent programming board for other applications. On the Froboduino board there is 4 Pin programming port marked as PR. The port 1 of PR goes to RSET. We need to connect RSET to the next 5V port. There is two pin jumper in te kit. Connect RSET and 5V with the jumper. Connect PIN2 of PR to Rx piun on Uno and Pin3 to Tx pin of arduino. Connect Uno to your compuer with the USB cable. Take two red Leds from the kit and connect Red wire to L1 port +ve and Green wire to L1 port -ve, similarly, connect the other Led to L2 +ve and -ve ports. After you have succesfully set up your arduino IDE. It is now time for your first program on Froboduino. We will first begin with connecting motors and controlling motion with two geared motors provided with Frobo kit. Connect +ve terminal of left Motor to M1+ and - ve terminal to M1-. Similarly connect right Motor to M2 +ve and -ve ports on Froboduino. Let us look at the motor controlling code. //This is the basic froboduino code for controlling motors to move in different directions. //This code will move Frobo forwards for 5 seconds. // accelerator powers the motors, so any movement, we have to set it "High". // Let this motion continue for 5 seconds (5000 mili seconds). // This code will now turn frobo left for 3 seconds and will move it forward for 5 seconds. // by stopping left motor and running right motor, we will move Frobo in left direction. //This code will Frobo backwards for 5 seconds. //This code will turn frobo in right direction for 3 seconds in backward motion. // This code will stopFrobo for 5 seconds. //Imagine controlling motion to create dance effects. Try moving from forward for 1 second and then turn left for a second and turn right for a second and make it move backwards for 4 seconds. This is an exercise for you. How did you like your your first lesson in Frobduino/Arduino? This is just the beginning of an exciting series of robotic lessons. In the subsequent parts, we will learn about other output devices and sensor data reading.